Lagoon-style pools, Coral Sea views and chilled-out seafood restaurants are all part of the package when holidaying on Hamilton Island, and families need not miss out. To help you pick the perfect tropical abode for your tribe, here’s our guide to the island’s best accommodation for families. 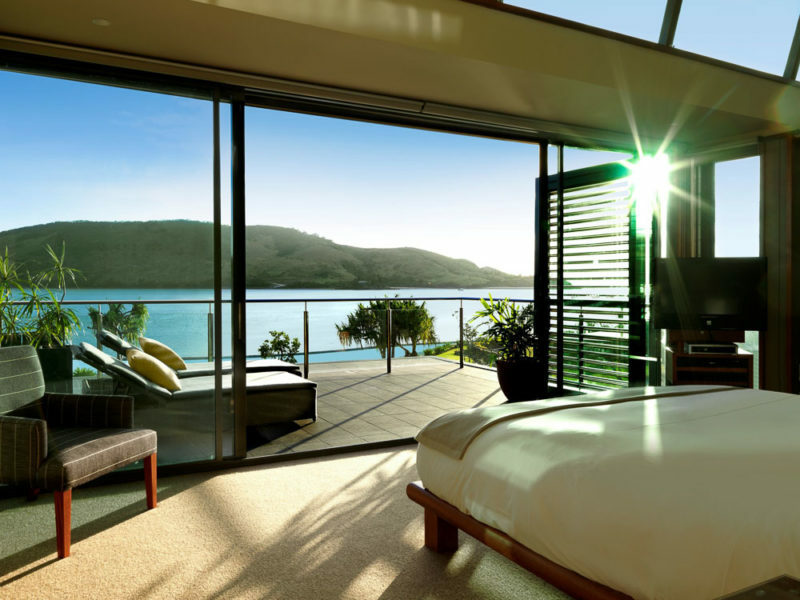 No need to get out of bed for glorious views at The Hamilton Island Yacht Club Villas . 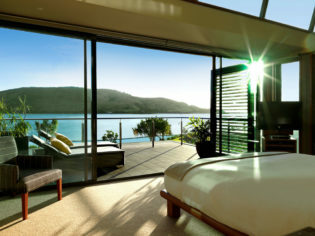 If you love splurging and have tiny tots accustomed to the high life, check into Hamilton Island Yacht Club Villas. As the name suggests, this accommodation is on the waterfront, at Hamilton Island Marina and next to the architecturally impressive club (enjoy a glass of Champagne on the Bommie Deck while the kids search for turtles in the clear water below). Probably the most upmarket restaurant on the island outside qualia, Bommie at the Hamilton Island Yacht Club has superb views and seriously good locally sourced food. The villas are contemporary in style and perfectly poised on the hillside, with views of Dent Island Passage and passing sail boats. Aside from being close to the club, the villas are also within skipping distance to the marina’s restaurants, cafes and shops. Pop into Manta Ray restaurant for a lunch of tiger prawns, calamari and fish ‘n’ chips, and be sure to ask about the kids-eat-free deal. The outdoor entertaining areas at a Hamilton Island Yacht Club Villa comes with the essentials – view and BBQ. The Yacht Club Villas also have modern kitchens for when you’d rather stay in, as well as access to a lagoon pool. The four bedrooms and four bathrooms are great for multi-generational holidays and groups. You can also request a cot and high chair if you’re travelling with a baby or toddler. If your children are above 16 years of age, you can book into one of the gorgeous pavilions at qualia, perched atop Hamilton’s northern hillside. This ‘six-star’ resort is not typically viewed as child-friendly, but we couldn’t write about Hamilton accommodation without giving qualia a nod. At $1300 a night, staying with a teen at this exclusive property warrants a special occasion – their sweet sixteenth, perhaps – but it’s certainly one they’ll remember. The pavilions have private pools and there are two on-site restaurants, and don’t forget the exclusive spa where mother and daughter will be tempted to enjoy some pampering together. Check out our exclusive review – Is qualia still the best resort in the world? If your kids have flown the coop, or are about to, it’s also worth checking out the adults-only Beach Club. Ground floor rooms with garden access at , Hamilton Island Beach Club. It’s a peaceful oasis for older families and multi-generational trips with grandparents, as there’ll be no rug rats racing around the restaurant. Smack-bang on Catseye Beach, the resort has 57 rooms, a private restaurant and lounge, and an infinity pool (hello, Instagram). Guests are also free to use any of the club’s sports equipment, including catamarans, paddleboards and kayaks. If qualia is out of reach, not your style or you’re travelling with young children, you’ll want to check out the four-star Reef View Hotel, which caters to couples, families and groups. This popular accommodation has modern twin, family, king and wheelchair-friendly rooms, as well as one- and two-bedroom suites, and a luxurious Presidential Suite. Our recommendation is the Reef Family Room (from $580 per night), which has a master suite with two queen beds and a separate junior room with two singles. Among the hotel’s major selling points is its fantastic location opposite the island’s main beach, Catseye, a great spot to launch a paddleboard or go for a snorkel. After checking out Catseye, stop by Reef View’s tour desk and sign the family up for a morning of tube riding, wakeboarding or water skiing with Hamilton Island Watersports. The tours are available daily (weather dependent) and based out of Marina Village. You’re looking at around $30 for a 10-minute tube ride and $65 for 20 minutes of water skiing or wakeboarding. Other lures of Reef View Hotel include the 35-metre swimming pool and stunning Coral Sea views from private balconies. If you don’t snag an ocean-side room, you’ll still feel a world away with vistas of the hotel’s tropical garden. Expect to be visited by the friendly cockatoos (say hello, take a photo but don’t feed them). Other facilities include the relaxed Pool Terrace restaurant, which serves a buffet breakfast, light lunch and an à la carte dinner, and has a kids-stay-and-eat-free offer. There is also a more casual but stylish lounge for quick bites. For seclusion without the price tag, make a reservation at Palm Bungalows, a stroll from Catseye Beach. The bungalows were recently refurbished and each has a king bed, kitchenette, bar fridge, microwave and tea and coffee appliances. Set amid lush gardens, you’ll quickly feel at home. When you want a break from whipping up brekkie, head on over to Reef View Hotel, where Palm Bungalows’ guests can enjoy the buffet breakfast. There are also plenty of holiday home options on Hamilton Island, all of which have air-conditioning and are self-catering. The range of houses, apartments and villas are great for larger families, with sleeping arrangements suitable for anywhere from four to 14 people. Most of the accommodation choices come with a golf buggy that guests can use to zip around the island, while some have private or shared pools. Some of our picks include The Edge and Ala Moana. If you want to pick up more groceries while on Hamilton, there is an IGA supermarket, open daily, in the Marina Village. You’ll be able to buy fresh fruit and veg, as well as meat and general pantry items. The supermarket is plastic bag-free (a big plus in our books), so don’t forget to pack a few cloth bags in your luggage. Also on Front Street is Bob’s Bakery, great for stocking a picnic basket or grabbing croissants for breakfast.